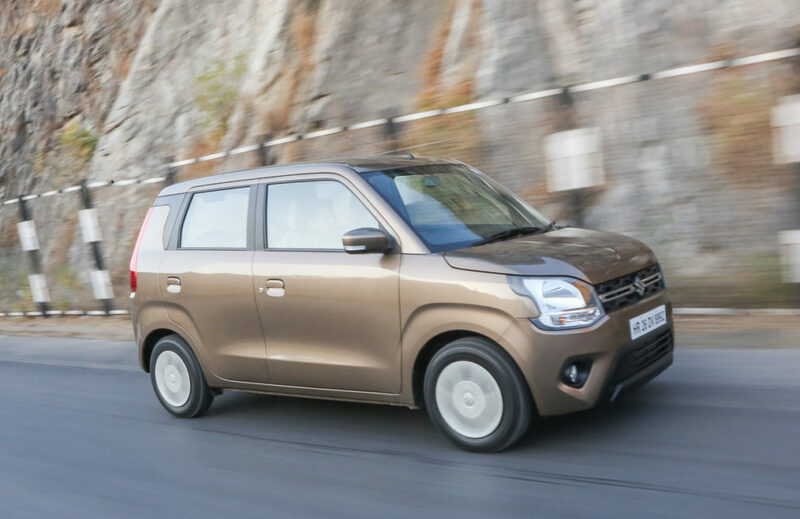 The Wagon R name is synonymous with Maruti Suzuki’s success for almost two decades and it is one of the cars that laid down the foundation triggering a huge momentum among family-oriented buyers in the volume space. In its 20th year in 2019, the leading carmaker in the country has brought in an apt upgrade as the Wagon R finally switches away from its no-frills character to a modern demeanour. 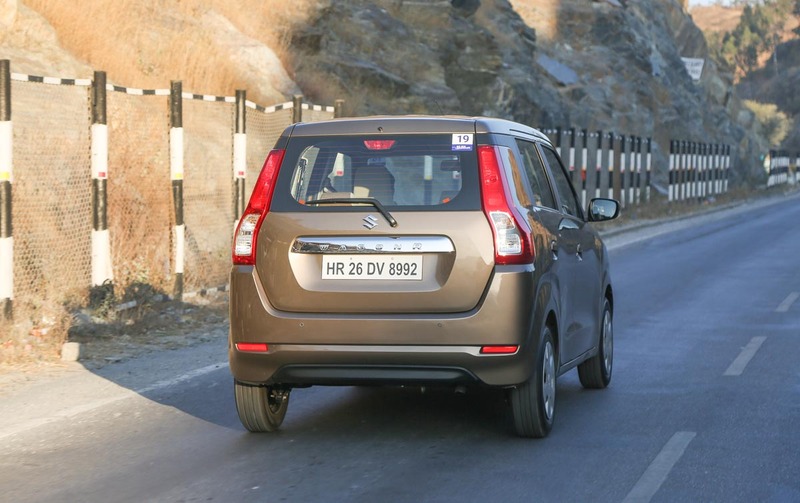 Having been through a lifecycle of not-so-greater upgrades in its two generations, Maruti Suzuki has impressively managed to maintain its sales consistency with the Wagon R as more than 22 lakh units have been retailed and just in 2019, over 1,52,020 deliveries were made as part of reaching the final 10 lakh mark in just over 6 years. 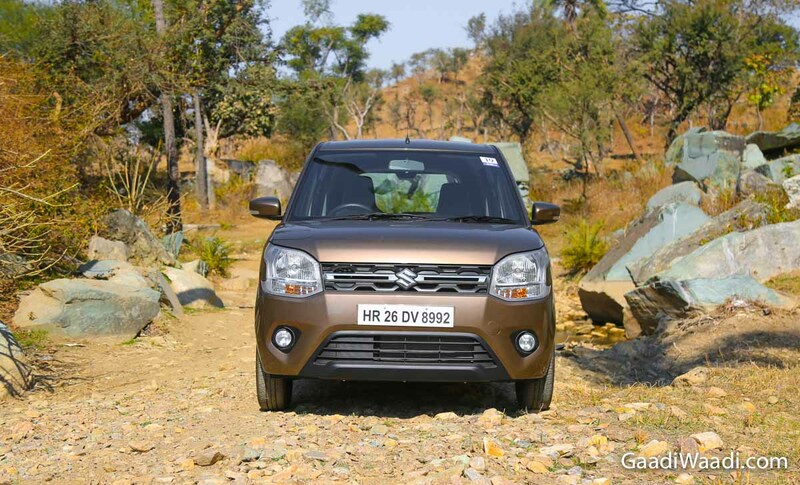 Glancing over the exterior, you could see that Maruti Suzuki has used an evolutionary approach to design. Compared to the previous model, the changes are India specific and they do not replicate the latest sixth-generation Wagon R sold globally. 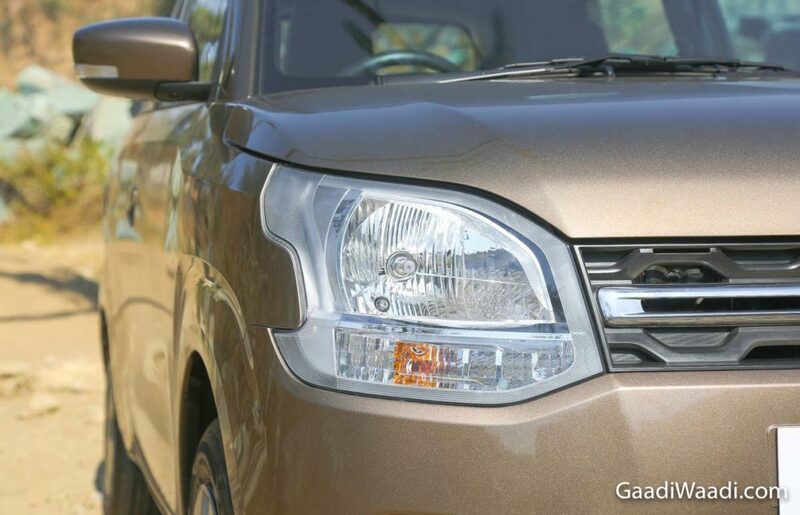 Up front, the updated grille that Maruti Suzuki calls as “architectural grille” has a unique presence and with the black inserts, it has become more prominent than ever. The headlamps are slimmer and wider with dual split alignment while the bumper section is redesigned with new round shaped fog lamps and housing. The air inlet is wider and finished in black colour for a two-tone appearance. The bonnet is shortened and dips down to allow for driver’s better road visibility. 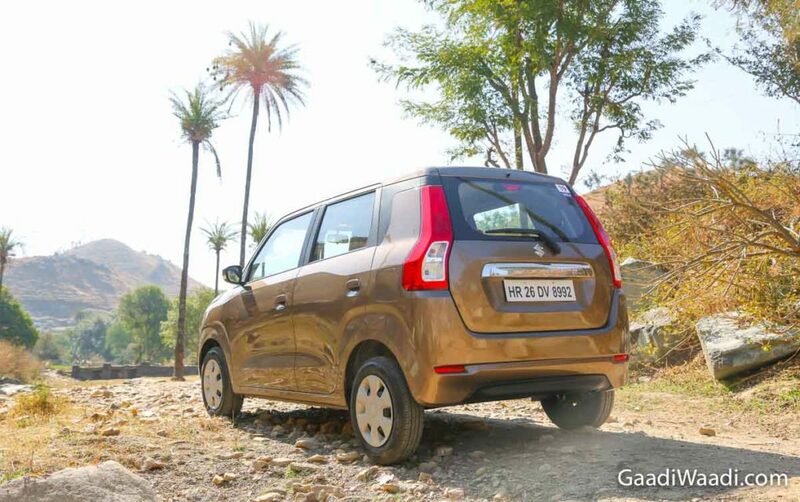 The side profile has 14-inch wheels with MRF ZVTV tubeless tyres and the upright pillars are retailed to maintain its authentic tall-hatch nature. The body panels have been cut in just above the wheels for a flared arch look while the redesigned C-pillar with the absence of rear quarter glass has enhanced the overall stance with the black elements hiding the bulkiness to give a floating roof design. The roofline itself is fairly straight as the older model but without roof rails and the wing mirrors with turn signals are adjustable and retractable electrically in ZXi grade. The updated continue on the rear as the vertically positioned pillar-mounted tail lamps look more dynamic and is shaped along the pillar design. It is accompanied by bigger chrome nameplate positioned above the registration plate. There’s no roof integrated spoiler, and instead, the stop lamp is repositioned inside the hatch door. The rear bumper gets its share of design updates with two reflectors while body coloured bumpers is standard across the range and body coloured ORVMs and door handles are available in VXi and ZXi. Both the exterior and interior can be customised from three different packages: Robust, Playtime and Casa and they offer dual-tone front and rear extenders, wheel arch cladding, front and rear number plate garnishes, side underbody protector, etc. The interior, on the other hand, can be had with new sill guards, door visors, variety of contrast designer mat and seat cover finishes, new steering wheel cover and more. Maruti Suzuki does not offer the 2019 Wagon R with alloy wheels and spoilers even on the top ends but they can be optioned from the accessories list. The six vibrant colour options in which the new Wagon R can be had are Poolside blue, Nutmeg Brown, Autumn Orange, Superior White, Silky Silver and Magma Grey. The new Wagon R is based on the fifth generation Heartect platform as the Baleno, Dzire, Ignis, Swift and recently launched Ertiga. The availability of the new architecture meant the hatchback’s kerb weight has lowered down, between 50 and 65 kg depending on the variants (805-845 kg), with increased rigidity and stiffness to comply with new safety standards. More crucially, it helps in the handling and composure bits of the new hatchback along with bigger proportions for a more roomier cabin. 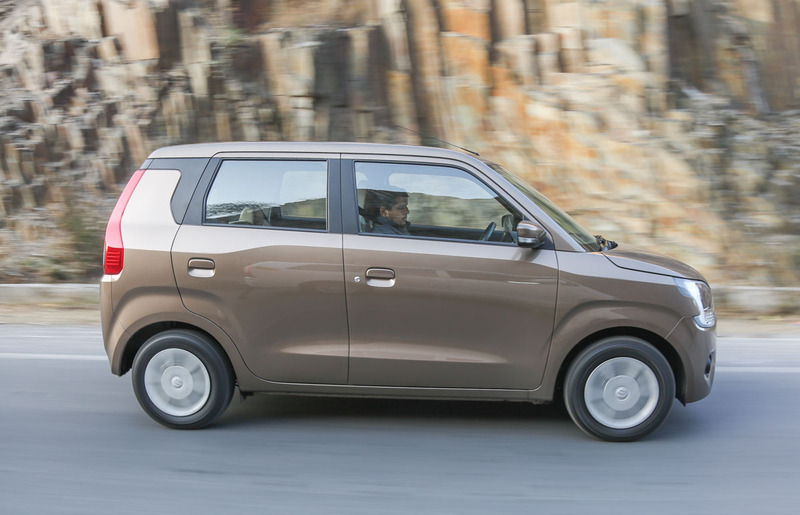 It is longer and substantially wider than the second-gen Wagon R while the wheelbase has grown by 35 mm to 2,435 mm and is now similar to the Ignis. The fuel tank capacity now sits at 35 litres (3 litres more) and the biggest improvement is on the trunk capacity. 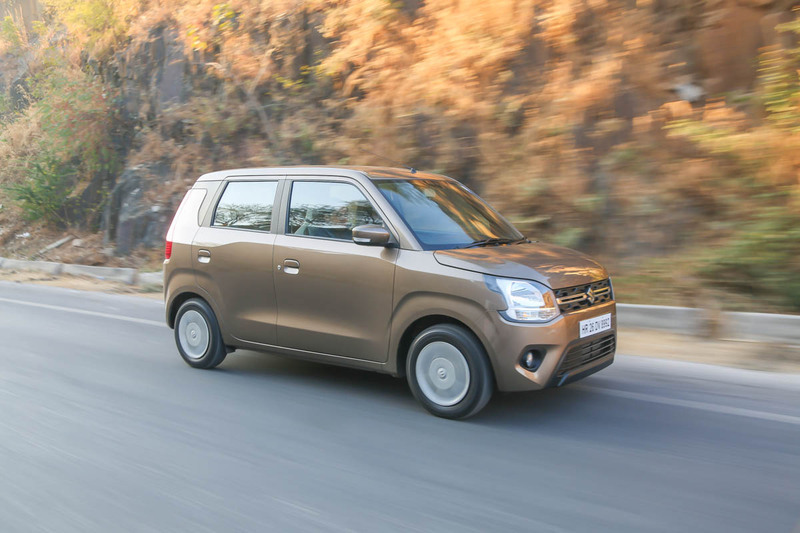 Maruti Suzuki calls the bootspace as best-in-class and it has got deeper and wider to accommodate more than 340 litres – larger by well over 150 litres. With 60:40 split rear seat in top-spec variants, the practicality that the Wagon R is accustomed to, has improved by a big margin. The interior is a radical departure compared to the previous model and the use of good quality plastic materials is a welcoming addition. 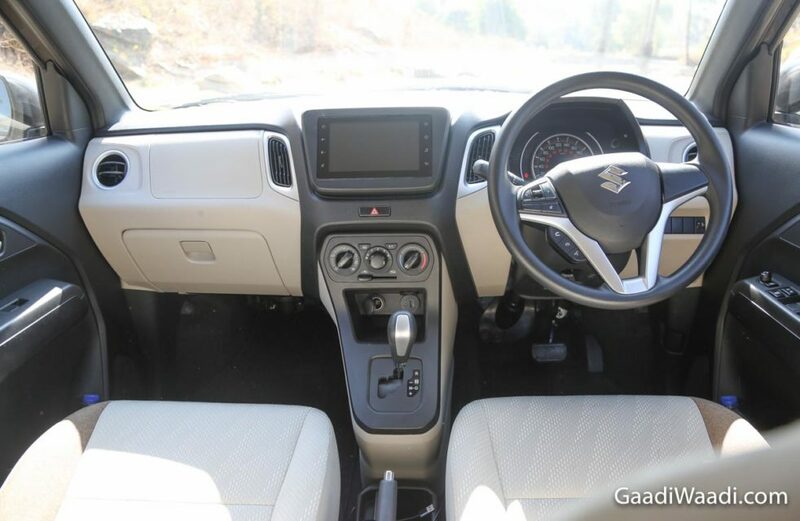 The centre console gives a floating dashboard feel and the AGS shifter pattern is typical to every other budget Maruti Suzuki’s money can buy, and the clunk while shifting between reverse, neutral and drive can be felt. The metallic garnishes in the gear shifter, around the air conditioning vents and the steering, add a neat touch to the dual-tone black and beige theme and enhance the premium nature of the hatchback. The major highlight inside the cabin is the seven-inch touchscreen infotainment system with Apple CarPlay and Android Auto connectivity with SmartPlay studio. 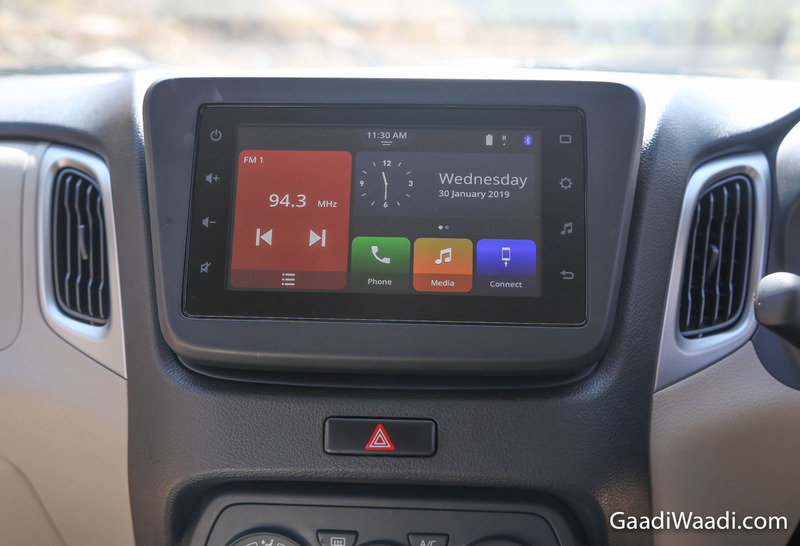 The SmartPlay studio with responsive touch function has been intuitive with Bluetooth, voice recognition and navigation. The steering wheel has integrated controls for hands-free calling and audio. The SmartPlay Remote turns the smartphone into a real-time remote controller and the vehicle alert system shows updated vehicle performance and door open warning among other functions. The instrument cluster is a whole new unit with the reddish amber theme until VXi and white illumination in the ZXi. It displays necessary information like the driving range, low fuel warning, digital tachometer, gear position indicator, instantaneous and average fuel consumption, door ajar and headlamp on warning. The Indo-Japanese manufacturer has equipped the new Wagon R with several standard features such as driver side airbags (front passenger airbag optional in LXi and VXi), reverse parking sensors, central locking, ABS with EBD, seatbelt reminder for driver and co-pilot, speed sensing auto door lock and security alarm in VXi and ZXi, etc. The seatbelt pre-tensioner and force limiter feature is used only in ZXi and optional in others. 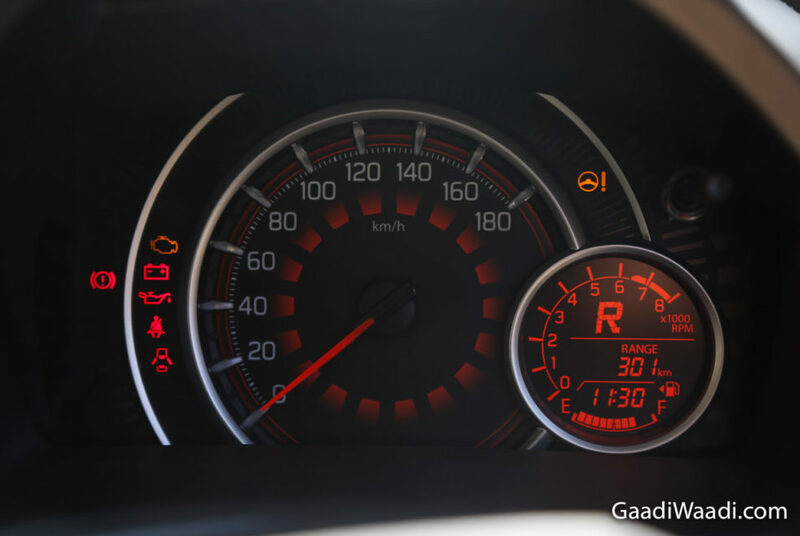 The speed alert warning sensors send out two beeps every minute if the speed crosses 80 kmph and when at above 120 kmph the beep continues non-stop until the speed is reduced. In response to the growing competition in the segment and to lure in a wider set of customers, Maruti Suzuki has cleverly expanded the price range of the new Wagon R by offering a new petrol engine. 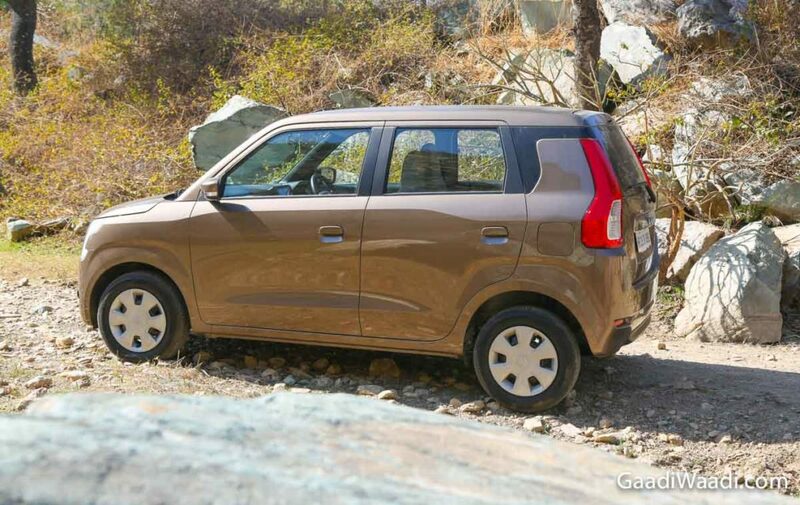 Along with the 1.0-litre K10B three-cylinder, DOHC petrol unit making 67 PS at 5,500 rpm and 90 Nm at 3,500 rpm, the tried-and-tested 1.2-litre four-cylinder DOHC K12M mill that is employed in the Swift, Dzire and Baleno has been introduced. It develops 83 PS at 6,000 rpm and 113 Nm at 4,200 rpm. The smaller engine continues to be sold in LXi and VXi grades while the new powertrain takes its place in VXi and ZXi variants. Both the engines can be had in either five-speed manual or five-speed AMT transmission to address customers depending on the different price bracket. 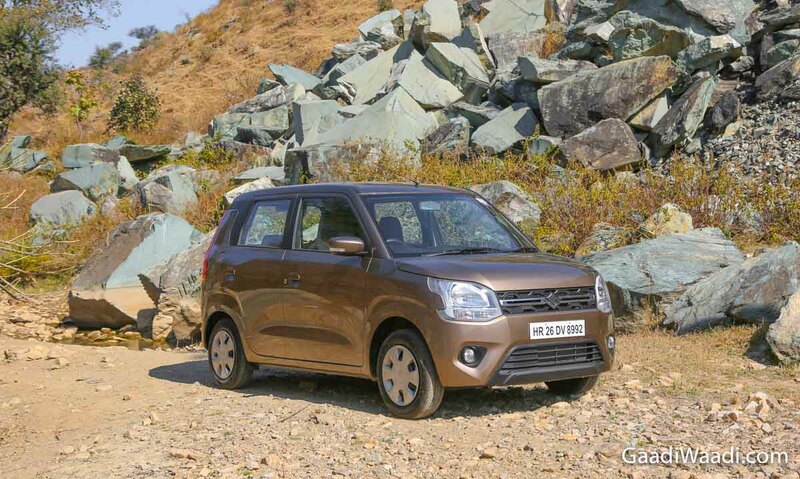 Maruti Suzuki has crammed in the new engine for good use and the Heartect platform supports it with much-improved driving feedback. Resultantly, the mileage figures have improved as the Wagon R is claimed to return 22.5 kmpl and 21.5 kmpl on the 1.0-litre and 1.2-litre petrol engines respectively. With our day behind the wheel, it is easy to say that the ARAI-certified figures are easily attainable and above 23 kmpl is achievable in any typical driving conditions. The Heartect platform has brought its charm of enhancing the ride quality in the new generation Wagon R. From the outset, it can be said the ride quality is incomparable to the Swift and Ignis that it shares engine and architecture with. However, compared to the last-gen Wagon R the improvements have been apparent. Sitting inside, you could feel the extra cockpit space for the driver being offered as the dashboard protrudes at the centre console and curves in to allow for good driver as well as front passenger leg room. The steering wheel can only be tilt adjusted though and the headrests cannot be even in the high-end variants. I also wished the seat could have been adjusted for height to further improve driver’s comfort on long journies. If you want to have a little driving fun with the new Wagon R, the 1.2-litre variant will be largely appealing. The throttle response is not quite immediate on the five-speed AMT (AGS) we drove but it does come alive in traffic conditions with effortless characteristics. The power delivery is adequate in the lower rpms for a small hatch like Wagon R considering the family-oriented buyers it aims at. The new powertrain addition is a big departure in the right way from the smaller 1.0-litre engine and it gives good driving confidence. The platform does come on its own especially on the highways as higher speeds can be dealt with in ease. There have been a few surprising bits I really need to talk about! One is the vastly improved suspension. The MacPherson front strut and torsion beam rear with coil springs absorb the average bumps easily while the front disc and rear drum brakes do have appreciable composure levels even while braking hard from three digit speeds. The engine does not rev freely as its behaviour depends on the throttle input and the transition between each gear is smooth only in the lower speeds. The much improved braking stability and suspension are accompanied by a rather quieter cabin as the NVH levels are a segment above in my opinion. There were no unwanted rattlings and vibrations felt on the steering wheel and it’s a brand new unit. However, the feedback in the lower gears could have been improved and having said that the feedback is a notch above compared to the last generation Wagon R.
In the top-spec ZXi variant, the cup holders on all four doors are usable while the door pockets provide decent space for everyday belongings. The 1 kg tray under the front passenger seat is another practical feature but the glove box has very little space. The centre stack is also part of the third generation upgrade with the gear lever in handy position to operate along with USB charging port, Aux and 12V socket installed inside small utility space. The 2019 Wagon R does indeed have some amount of body roll due to its tallboy nature but it’s another part where significant improvement has been made. 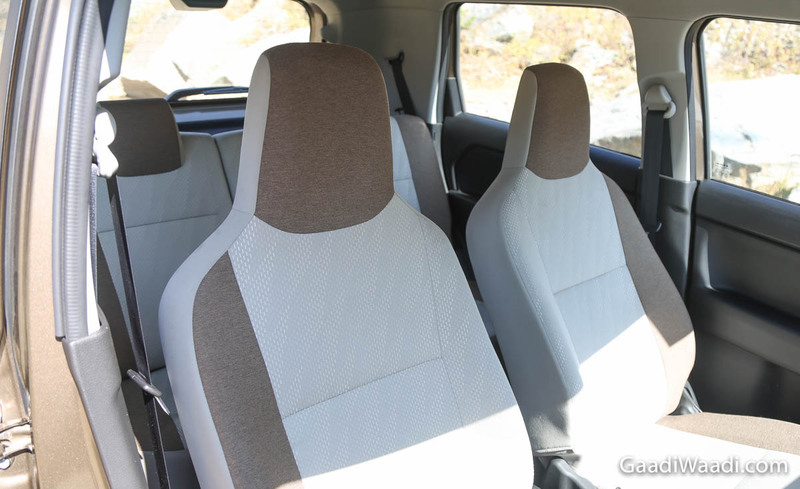 At the rear, three adults cannot sit abreast with enough comfort but it’s manageable for short trips (two adults and a child is ideal) and the middle passenger area can be converted into a foldable armrest. The 135 mm longer wheelbase has aided in adequate leg and head room even when the front seats are partly reclined while the rear thigh support is decent enough. The remote keyless entry and rear defogger are the other features that make the life easier. The new Wagon R is priced between Rs. 4.19 lakh and Rs. 5.69 lakh (ex-showroom, New Delhi). Despite the exterior makeover, upgraded interior, premium interior and standard safety features, the price increase compared to the last generation model has been minimal. 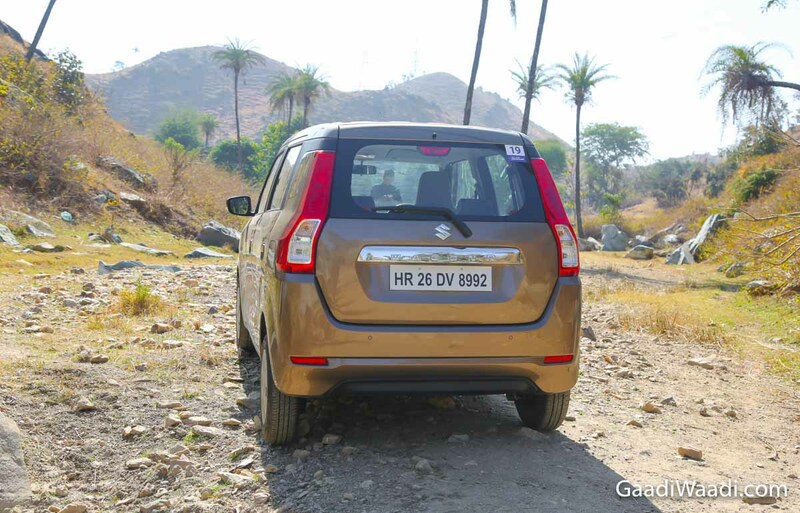 It speaks volumes into how committed Maruti Suzuki is to keep the Wagon R nameplate going for years to come while retaining its price advantage. At the end of the day, the dynamic and spacial improvements made courtesy of the new platform outshine the small niggles like the lack of steering feedback, non-availability of adjustable headrests, alloy wheels on top-end variants and driver seat height adjustment. The new Wagon R has all the ingredients to replicate the success of its predecessors and ticks all the right boxes for customers wanting to remain in the segment with upmarket features, more spacious interior and boot complemented by modern looks paying the same price. And for the enthusiasts wanting to own smoother and decently powerful 1.2-litre fuel-efficient petrol engine, you need not have to look away for any budget option than the 2019 Wagon R – the new entry-level Heartect platform based car in India.